It’s happening. The trying, testing time that every parent of a toddler girl fears — something that will cause countless moments of stress and anxiety in the months to come. Eleanor is developing a preference for the color pink. Yes, indeed. When given a plastic plate and cup for dinner, it’s whinewhinewhine unless it’s a pink cup and plate. 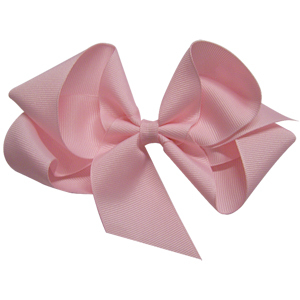 When choosing a hairbow for the daily ponytail, she insists that it be a pink hairbow. When she found my dispenser pack of paper label, she only wanted to take out and stick the pink labels all over the furniture. “Pink is my favorite color,” she says, relishing the ability to say so. Don’t look at me like that. It’s not like I’ve been all Princess-A-Go-Go since she was born. I’ve thrust diggers and trains at her. We read stories about pirates. Don’t look at me. Well . . . okay. She was a princess for Halloween two years ago. And there’s been a growing collection of pink toile-y garments in the dress-up box, swelling like a Pepto-Bismol-colored fungus. But really. It’s The World that’s done this. Not me. Brian went into the kitchen and emerged with — horrors! — a green and orange bib. Evil Eye, faux-meek “pleeease,” and the only pink bib Brian could find was the one that says “I Love My Big Sister!” on the front. Ella patted the bib down onto her tummy and wiggled her hips happily into the corners of her booster seat. Brian and I couldn’t help but smile at this. “Oh, do you love your big sister?” Brian asked her. “Yes. I love Eleanor,” she replied. Ella Sarah Gets Dressed by Margaret Chodos-Irvine. You gotta love the sunshiny jewel-toned silkscreen prints that chronicles Ella Sarah’s efforts to pick out her own clothes, despite what her family would rather have her wear. Read it a few times, and you’ll find yourself joyfully memorizing the list of clothes.